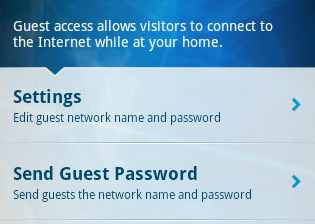 Guest Access is a Linksys Connect feature that allows your guests to access the internet without connecting to your main network. With Linksys Connect, you can send your Guest Access settings via email using your Android™ device. NOTE: Make sure your Android device has an active internet connection and you have Linksys Connect installed. To know how to download and install the Linksys Connect software, click here. 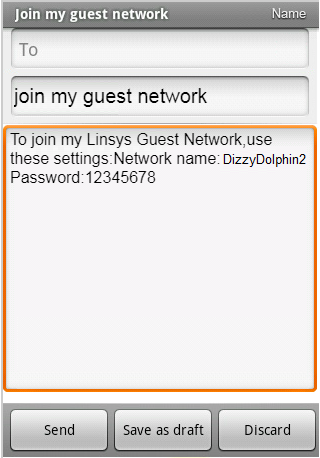 Launch Linksys Connect on your Android device and log in to your Linksys Wi-Fi router. QUICK TIP: You can verify your Guest Access settings by tapping Settings. Enter the recipient’s email address on the To field and tap the Send button. NOTE: A default message will be available containing your guest Network name and Password. Your Guest Access settings will be sent via email.